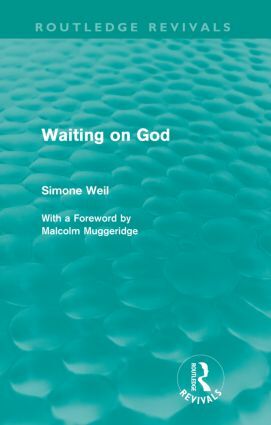 A work first published in English in 1951, Waiting on God forms the best possible introduction to the work of Simone Weil, for it brings us into direct contact with this amazing personality, at once so pure, so ardent, so utterly sincere, yet normally so reserved that only her closest friends guessed the secrets of her inner life. The first part of the book concerns her letters written to the Reverend Father Perrin, O.P., who befriended her at Marseilles and, the only priest she knew, became her intimate friend. The second part of the book concerns essays and reflections on such subjects as education, human affliction and the love of God, prayer, and forms of the implicit love of God.